(26 May 2011) The 15th New Zealand Ice Cream Awards were announced in Queenstown on Thursday, 26th May 2011. Simply the Best!! As the classic Tina Turner number states - this was the description of one of the Supreme Award winning ice creams in this year's New Zealand Ice Cream Awards. For the first time since its inception 15 years ago, there are now two Supreme Awards awarded to the best ice creams over 9 different categories. It has been recognised that small boutique manufacturers and major ice cream manufacturers (those producing more than 500,000 litres per year) have quite different positions in the market and the Awards should recognise and reward this. While the smaller boutique manufacturers have the ability to include more indulgent flavours and smaller batch sizes for consistency and control, the larger manufacturers often have the technical teams and greater resources for product development. 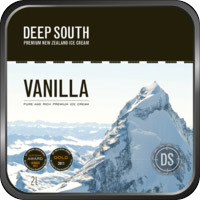 With perfect scores for creaminess, smoothness and flavour intensity - the Supreme Award for a Large Manufacturer this year went to Deep South Ice Cream Vanilla made by Deep South Ice Cream. Judges described this vanilla ice cream as "simply the best" - no indulgent flavours to hide behind - this ice cream is simple and clean with perfect texture. Supreme Award for a Boutique Manufacturer this year was awarded to an entry in the Gelato category. The winning entry was Coconut & Lime Curd Gelato made by Takapuna Beach Café and Store. The combination of flavours in this gelato was described by judges as a clever blend of Thai and tropical influence blended perfectly with a smooth velvety texture. As well as the Gelato Best in Category and Supreme Award for a Boutique Manufacturer, Takapuna Beach Café and Store also won the Sorbet Best in Category for their Mango Sorbet. In its 84th year, the New Zealand Ice Cream Manufacturers' Association (Inc.) managed to achieve record numbers of entries from the highest number of manufacturing companies ever. Thirty one companies entered a total of 250 entries with a 45% increase in entries in the Gelato and Sorbet categories over the previous year. The main judging of the New Zealand Ice Cream Awards was undertaken during the first week of May at the Massey University campus, Food Technology Department in Albany, Auckland. The Chief Judge, Kay McMath and her team of five judges took two full days to judge the large number of entries split over the 11 categories. While the Premium Ice Cream (ice cream with more than 11% milk fat) remains a major category - the Gelato and Sorbet categories had 55 and 53 entries respectively covering a very diverse range of flavours from Earl Grey gelato to ginger beer sorbet. Fonterra Brands (Tip Top) Ltd won the Best in Category for both their Standard Vanilla Ice Cream as well as the Standard Ice Cream with Inclusions, with their Tip Top Boysenberry Ripple Ice Cream - a repeat winner from 2010. The judges had great difficulty choosing a winner in the Premium Vanilla Ice Cream category and awarded joint Best in Category awards to Deep South Ice Cream (which went on to win the Supreme Award for a Large Manufacturer) and Zest Ice Cream for their Heilala Vanilla Ice Cream. Twelve children from Maungawhau School in Mt Eden were presented with 15 ice creams to determine the winner of the Kids Choice Category. Each of the kids had to earn their place on the judging panel by describing "why I would make a good ice cream judge". Their responses included "I need air to breathe, water to live but ice cream to survive !!" Flavours to judge included the old favourites of Goody Gum Drops, Oreo Cookies and Cream and Hokey Pokey but also some new flavours of Pinkie Winkie and Lime Swirl. The "Yum" to "Yuk" scale was used with the boys having their clear favourite as well as the girls. Takapuna Beach Café and Store - Double Chocolate & Honeycomb Gelato was the winner of the Kids Choice Category. To challenge the judges, the Open Creative categories in ice cream and gelato/sorbet included some clever and different flavours. These included pork and apple ice cream, ricotta, honey and thyme ice cream and pear, walnut and blue cheese ice cream. Equally as creative were the Open Creative Gelato/Sorbet entries with gin and tonic sorbet, olive, beetroot and dill sorbet and fennel, raisin and saffron sorbet. Too difficult to pick an overall winner across the two sections of the Open Creative category - joint Best in Category winners were selected : Kaffir Lime and Ginger Ice Cream (Premium) made by Pure New Zealand Ice Cream and Italian Mandarin Stracciatella Gelato made by Pacific Flavours & Ingredients Ltd. The Premium Ice Cream category was the other class with a large number of entries (43). These ice creams, with their higher fat content, are more indulgent and can carry flavours more intensely than their Standard counterparts. There were 11 Gold Awards presented in this category with the Best in Category being awarded to Banana Split made by Patagonia Chocolates Ltd. The Low Fat category was won by boutique manufacturer Monte Gelato, based in Mt Maunganui, with their Yoghurt Berry entry. The New Packaging Category (for new packaging introduced in the last 12 months) includes packaging, shippers, outers and product containers. The Best in Category for New Packaging was awarded to Emerald Foods for their Killinchy Gold 125ml Range of ice creams destined for the Middle East. A full list of the 2011 Awards is here. Photos of the 2011 Awards presentations and winners here. 2011 New Zealand Ice Cream Awards category winners and full list of Awards. Photos from the 2011 NZ Ice Cream Awards presentations and Dinner, May 26, Queenstown.